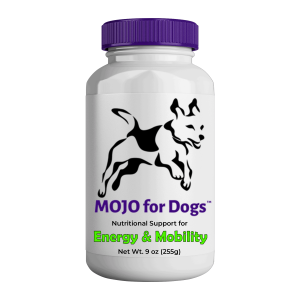 MOJO for Dogs™ works in 4 ways to help reduce inflammation and pain for dogs with mild to moderate osteoarthritis. What can u give a dog for pain? 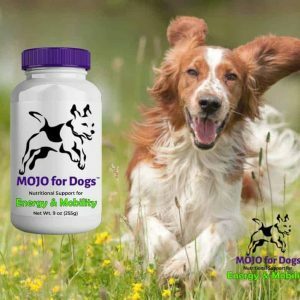 What can I give a dog for inflammation? Whether large breed or small breed, when a dog is in pain, it affects the whole family. Is my dog in pain? and a reluctance to move. 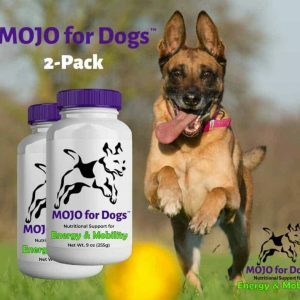 What do I do if my dog is in pain? The answer can depend on the cause. If your dog is in pain, it’s best to begin by having your dog examined by a knowledgeable veterinarian. A veterinarian can confirm whether or not a previously diagnosed issue is worsening, or identify any newly emerging health issues. 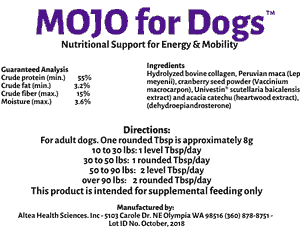 We love our dogs and want to make sure they get the best and proper care. appetite, vomiting, diarrhea, seizures, coma, and loss of blood clotting capabilities. 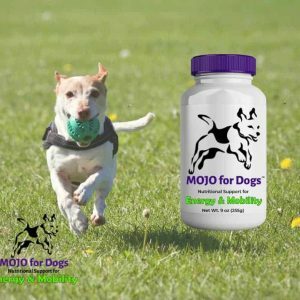 What can I give my dog for pain that doesn’t have side effects? discomfort is a common underlying cause of pain in dogs. Dog back pain is also common. 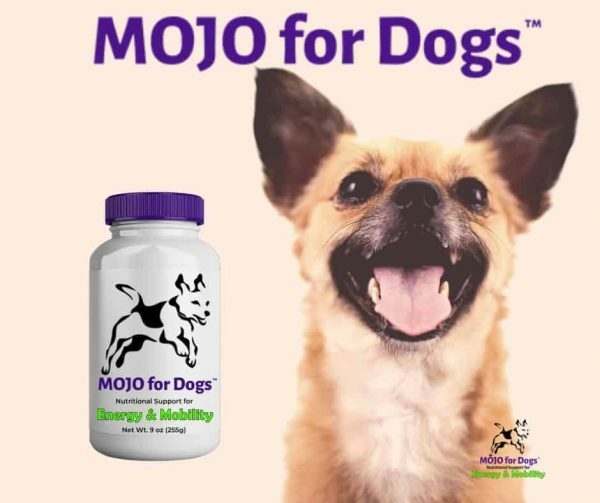 Veterinarians addressing polyarthritis in dogs have discovered that the nutrients in Mojo for DogsTM not only help decrease damage, but also promote repair! 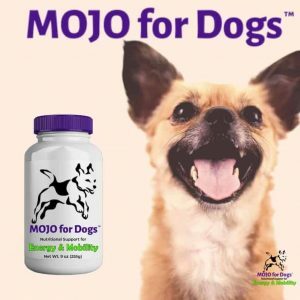 The ingredients in Mojo for DogsTM are natural and safe. 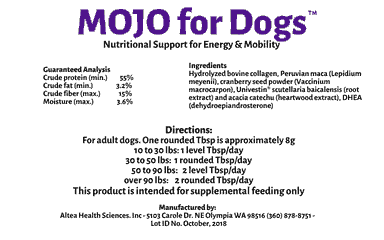 Give your dog the benefit of repair with Mojo for DogsTM! Reduces DNA damage in brain and peripheral blood lymphocytes. 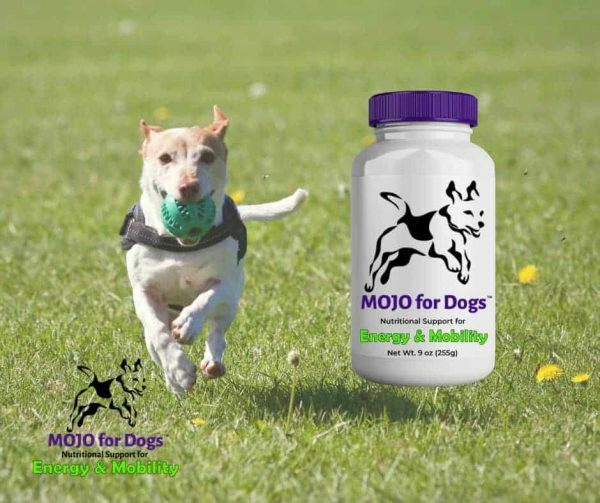 Regen-A-Dog is not a drug. 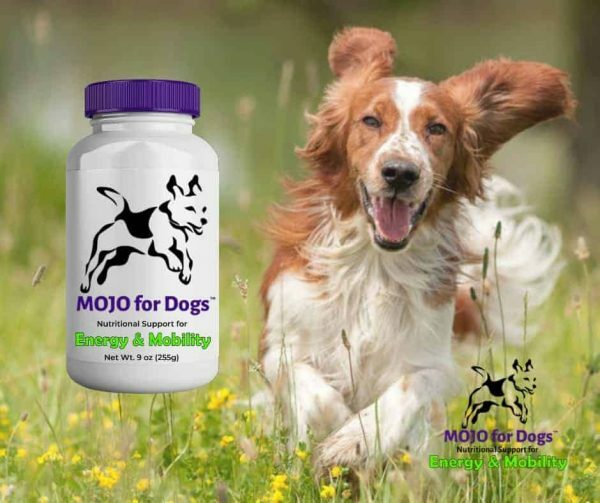 It contains baicalin, catechins and anti-inflammatory flavans and flavones derived from natural botanical sources. 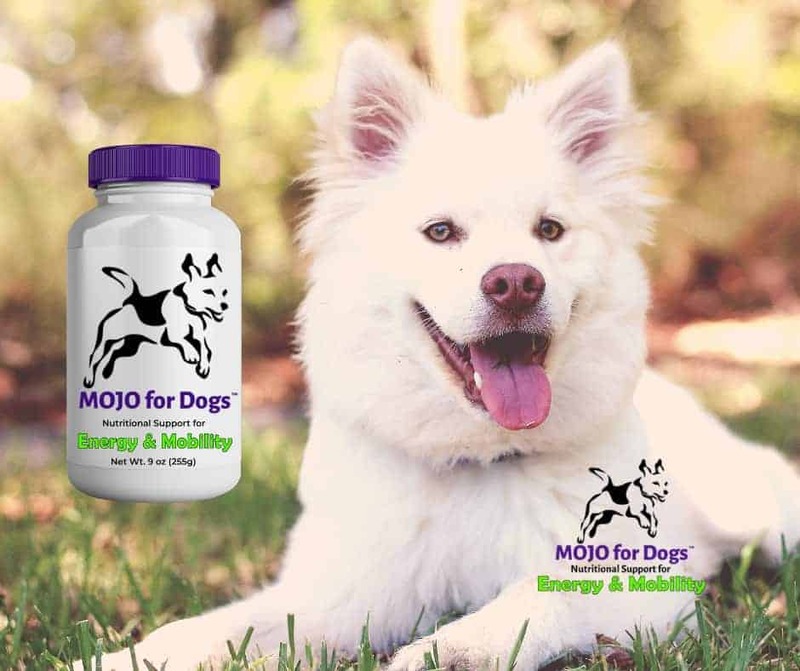 The hydrolyzed collagen is from bovine sources and, like the cranberry seed extract, is food grade for human use. My best friend Cedar has been by my side for 10 years now. She has been an awesome companion in my active life. She enjoys hiking, mountain biking, surfing, snow shoeing and basically anything and everything that I do. 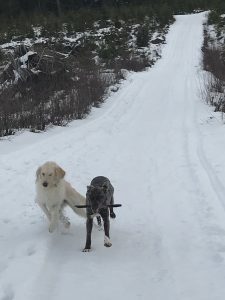 Over the last couple of years I have had to back off of some of the extremes in length and speed as I started to notice the repercussions of Cedar’s stiffness and soreness. 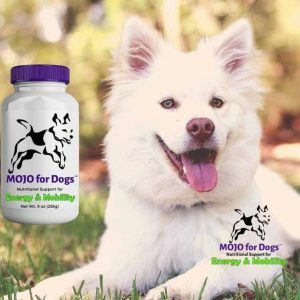 I decided to give your product a try to support Cedar and the high activity life that we still live. She loves this life and has never really wanted to slow down but wear and tear has been catching up with her. After two weeks, I had already noticed her recovery was so much shorter in length. It’s as if the stiffness and tension after long hard outings is no longer present. I noticed her leading the way through the tough snow on our dog adventures and keeping up with the young dogs. Not only keeping up, but instigating play and chase and wrestle with the 2 year olds pups. We are almost 4 weeks in now and it is still this way. I am so grateful for your vision and this product. Bello is our 8 year old golden retriever who was in so much pain, he would groan getting up or laying down. After just one week on Regen-A-Dog, we noticed a big difference in his energy level. He even started to initiate play with our 2 year old retriever! 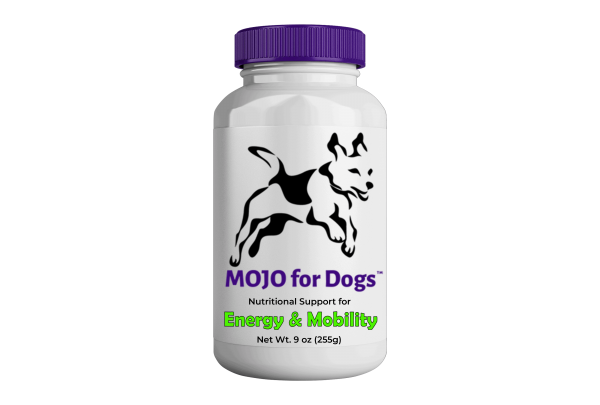 And then I realized, “hey; he’s not groaning or whimpering anymore!” We love this product! 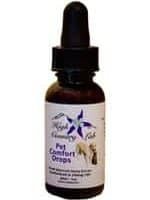 Copyright 2019 © Altea Health Sciences - All Rights Reserved. Powered by Fuseology. We appreciate constructive criticism and/or statements about what you believe may be flaws or oversights in our treatment of a subject. This doesn’t mean we like to argue, or that we are willing to waste precious time defending our statements to people who have not researched the matter thoroughly. Science changes as new information becomes available, and we are eager to examine different points of view.